This book takes you back to the 80's and back to being a teenager. April Grace thinks her sister Myra Sue is dumb just like most teenagers think of their siblings at some point or another. The problem with this book is that there is constant name calling throughout the whole book and it never seems to be addressed. 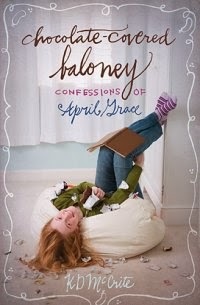 April Grace tries to find out just what her sister is up to, How to handle her Neighbor lady becoming her teacher, a new Baby coming home, And everything else that is changing in her life. I realize that the book shows what kids go through in the teen years but at the same time the name calling in the book may make it look like that is normal for a child that reads it and okay for them to do. I also did not see much of a christian base to the book although it is published by a christian company. Overall I had to give it a lesser rating because of the negativity and lack of a christian story to it.